Teaching our students about America, is one of the highlights of our school year. The following activities are used to draw their attention to a few of our country’s symbols. We use these activities in whole and small groups, as well as challenge students to try them independently. 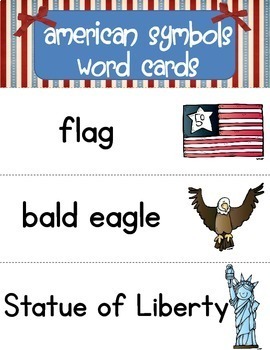 *American Symbols Word Cards – Use these to focus on key vocabulary and give students a pictorial representation of each word. You can also detach the picture part from each word and you’ve got an instant matching game! 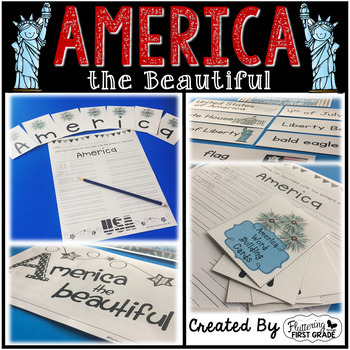 *America the Beautiful Little Book – Copy and cut apart each page along the dashed line. Collate and staple along the left side. 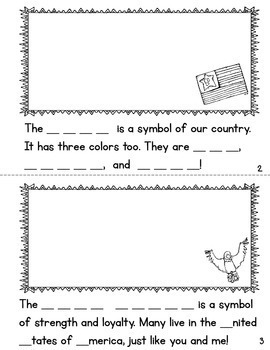 Students fill in missing words and letters, Have them color where appropriate, then try their hand at drawing each American symbol themselves in the box provided. 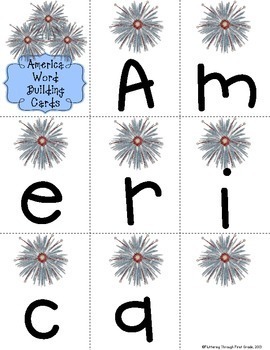 *America Word Building – How many words can you make with the letters in the word America? Print and cut the letter cards, then get building! Record as many words as you can on the recording sheet provided. To extend the learning, have students write sentences with the words they build on the back of the page. We’d love for you to come 'flutter around' our blog where we have more detailed descriptions of our products and freebies too! Like us on Facebook~Come Pin with us!